An unaltered night photo of the Nike Vapor described below. Cycling as serious transport in a country without a commitment to it requires a lot of guts and a lot of great gear. Over the years, I've gone through a lot of money and strife finding that gear. Below is one post in a series (see also visibility, security) profiling only the best gear that has worked for me. For wind and rain protection, I'll discuss the top down, then discuss the extremities. I'll skip the head since I don't use more than a helmet. In icy conditions, I can see getting a cover for the helmet but I didn't need one while biking to work in snow at the 2010 Winter Olympic Games in Whistler. I'll also skip eyewear since I haven't found any good way to keep those clear in the rain other than simply wiping on occasion. For the torso, there are some great options. However, it took a while to find them. For years, skiers and hikers have had gore-tex: a material that won't let moisture in but will let moisture out. The great value in this is to manage perspiration and rain at the same time. Having done all three activities (cycling, hiking, and skiing), I can safely say skiers and hikers never sweat as much as a cyclist. If breathability were needed anywhere, it is needed in cycling. 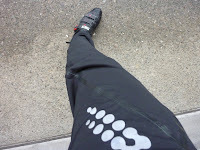 Given that, it is surprising how very little breathable material I've found in cycling outerwear. 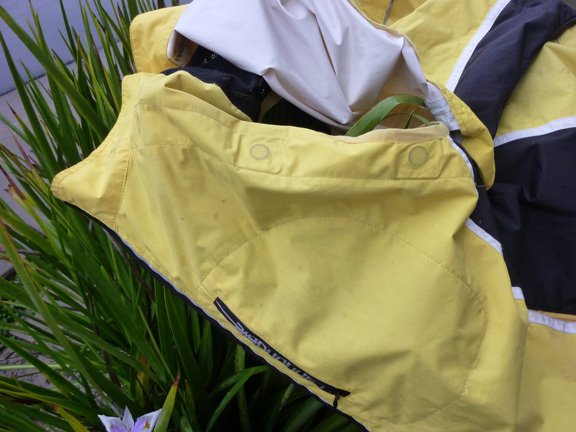 Instead, I find lots of plain old nylon jackets and pants with a little bit of elastic at the ends. The plain nylon outerwear tends to be a big sweat factory. Consequently, I avoid it like the plague with one exception. The nylon jackets with removable sleeves work pretty well. Obviously, having no sleeves is a great way to produce breathability. It obviously leaves you less protected which matters greatly in really cold conditions but I'll get to a solution for that later. 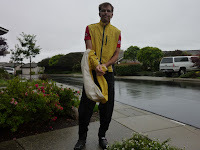 In most conditions, a jacket with adjustable sleeves has met most of my needs for rain and wind protection. Amongst the removable sleeve jackets, the best I've seen is the Cannondale Morphis Shell. This jacket is head and shoulders above all the other removable sleeve jackets because it is so easy to detach and attach the sleeves. It is the only one of its kind that I can do this while riding. 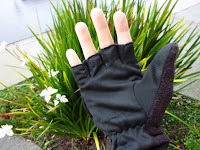 With other jackets, you might get the sleeves off while riding but you will be hard pressed to get them back on at all because they use snaps, zippers or velcro. Even if you could, it would not be as easy as it is with the Morphis. Why? Because the Morphis uses magnets, yes magnets, to attach the sleeves instead of zippers or velcro. These magnets break away more quickly and easily than any fastener but, more importantly, the magnets are self-attaching. When you are ready to re-attach the sleeves, you simply slide them on and the magnets find each other like something out of a Transformer movie. The jacket is simply incredible. This kind of rapid flexibility is just what I want while riding in mixed to bad weather. All the other jackets with removable sleeves make you stop and futz in the rain to get the zippers, snaps, or velcro together but with the Morphis I detach and attach sleeves with impunity as conditions change. It's awesome. The one issue is that the magnets leave space for air to get through the seams which can be an issue on very cold days. However, for those days you probably don't need adjustable sleeves at all. As amazing as the Morphis shell is, having no sleeves obviously provides no shelter for the arms. Consequently, I use this shell for moderately cold and relatively dry days, windy days, or days where I don't know what it's gonna do. For the really serious storm, a full jacket with breathable material is the way to go. You've got to really search in the bike shops but it is there. In the breathable category, the best I've found is the Endura Luminite Jacket. It uses a thick yet breathable material that feels really great. In addition to being breathable it is super visible. My friend Johan and I really value visibility since we are really not into premature death. 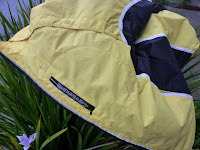 This jacket has a wealth of reflective material all over it and it comes in "day-glo" yellow (although it does come in black). If that weren't enough visibility, this jacket also has a blinking red LED light embedded in the back. I've worn the Endura Luminite Jacket on the worst kinds of days and not been wanting for anything else. It has velcro straps to close the sleeves and a very high, cinchable, collar to keep rain off your neck. I've even worn this sailing with satisfactory results. For all my talk about breathability, there is one jacket that I now exempt from that metric because it excels so greatly in other areas: the Nike Vapor Flash jacket. This is actually a running jacket but I think it is better suited for cycling. Partly because it is heavier than most running jackets but mostly because it is made entirely out of reflective material. The jacket is one big reflector. Cyclists need all the visibility they can get in any weather but foul weather especially. You can't get more visible than this when headlights hit you. Again, the jacket is made from a heavy material, is not breathable and its sleeves do not detach so I expected it to be another sweat factory. However, it has some major zipper vents to make up for the lack of breathability. And, so far, sweat hasn't been a problem at all. I was not sweaty after riding from the Embarcadero to Golden Gate park which has a few climbs. On top of that, I wore it into Cal Academy's 85 degree rainforest and was totally comfortable. We'll see if it feels this good in spring time. Regardless, the awesome reflectivity deserves special consideration. If you follow cyclist feeds on twitter, you know how many of us get hit every month. Given that, I choose visibility over breathability. One other plus is that it looks good even when you are not cycling so, for me, it doubles as work wear. When the light isn't hitting it, it is just a smart looking flat grey jacket. There's nothing better than rainwear with form as good as its function because it means you pack less and have less to change into when you finish your ride. Flexibility and breathability are sufficient qualities for outerwear covering the top of your body. However, since the real action in cycling is down below, outerwear for the bottom of your body needs something more: stretchability. 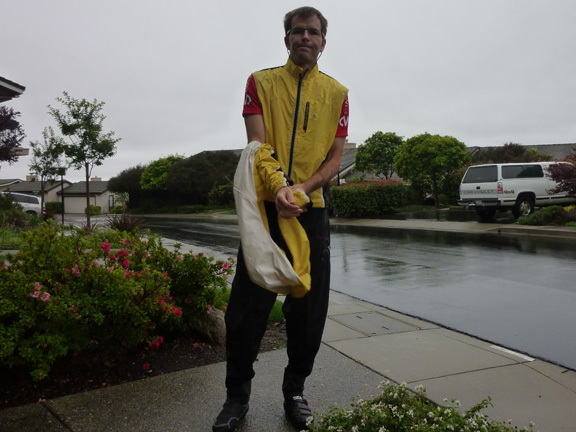 To keep things simple, I avoid long pants as long as possible and just ride in rain in bike shorts until it gets below 50 degrees fahrenheit. It's not uncomfortable while you are pedaling. Below 50 degrees, I'll throw on some long rain pants. 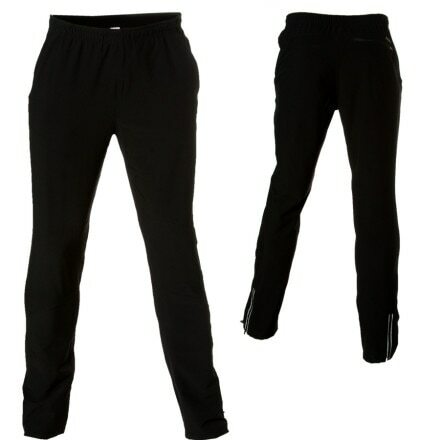 Thankfully these days, you can now find long rain pants that are both flexible, breathable and stretchable. The best I've seen of this type of outerwear is the Sugoi Firewall Pant. These pants breath and stretch beautifully. They have a nice reinforced material inside the ankle that keeps the cuff out of your chain without bunching tightly around your leg. They also have a zipper along the outside of the ankle to make them easy to slip over your shoes. 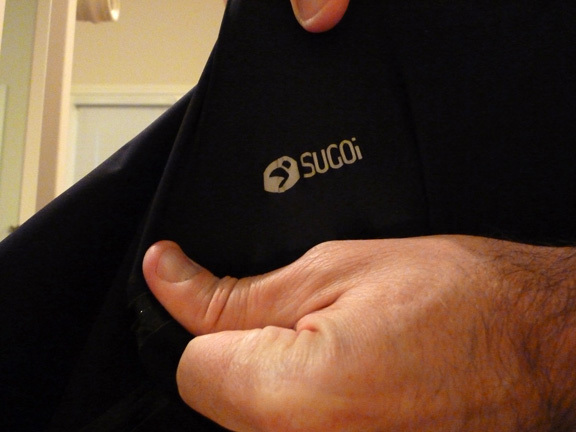 Running the Sugoi Firewall pant zipper is a two-handed operation so you can't do that while you ride. However, the only time I ever want to do that is when I forget to zip before I get on the bike which is kind of my bad. The zipper is tough to zip because of the rubberizing around it so it is a feature not a bug. Nevertheless, what really makes these pants stand out is the cut. These look and feel like regular pants. They have a matte finish to the fabric so they don't reflect light all the time like typical rubber rain gear. They even have two side pockets with zippers. The cut around the leg is just loose enough to look like normal pants. From a distance, if it weren't for some reflective graphics, you'd think they were slacks of some kind. I actually wear these pants for a night out. Throw a dressier top over your jersey and you can get passed the "Maître d'" at most restaurants. You'll still be a little funny looking but these days who isn't? Given this fashion feature, on top of the superb performance on the essentials, these pants stand out. 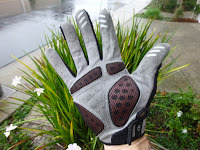 With these in my pack I can be out without worrying about the rain, cold, or even the possibility of dinner plans. In the latter case, I can transform from a bike geek to a relatively normal looking patron in a couple of seconds. For more on bike fashion, check out Diverse Bicycle Fashion. The Sugoi Firewall Pants, true to their name, are great for truly rainy days and they are passable as regular pants but since my original post, I've found that their sound gives away the fact that they are rain pants even if their looks don't. The make a swishing sound when you walk. For days when the rain is light but temp is low and/or the wind is high, I wear Patagonia Traverse Pants. 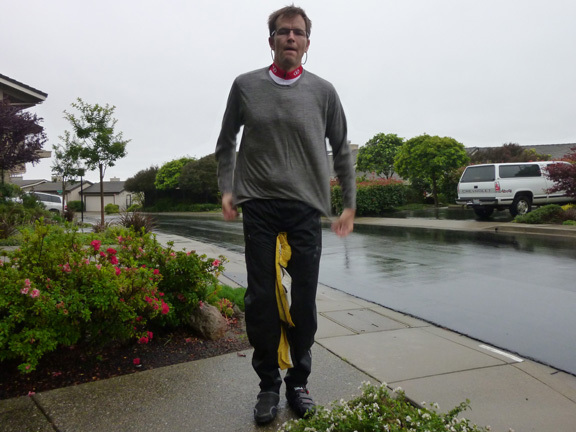 This is a "soft shell" pant that is really not rain gear at all. Nevertheless, light rain drops seem to bead up and blow off anyway. What you lose in waterproofing, you gain in breathability, comfort, and style. They feel like regular pants. Sweat is never a problem. Neither is comfort because they are a loose fit that is moderately stretchy. The Firewall Pants might actually stretch more but these Traverse Pants feel more forgiving because there is no water-resistant membrane to stick to your legs. Finally, the Traverse Pants look almost like slacks so these really do double as workwear for me. The reflector on the ankle zipper is telling but I still wear these most places I go without hesitation. One catch with the Traverse Pants is, like a lot of Patagonia stuff, they seem to be out of production already. Patagonia does bring back items over time. Nevertheless, right now you have to buy them from a third party because they are not in Patagonia's catalog at the moment. Last but certainly not least are extremities. I'll start with the feet. First of all let me set the context. 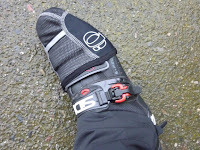 If you are riding without clip-less pedals then you can obviously wear any kind of shoe which allows you to pick any kind of protection you want so the comments on footwear below are moot. You can skip to gloves. 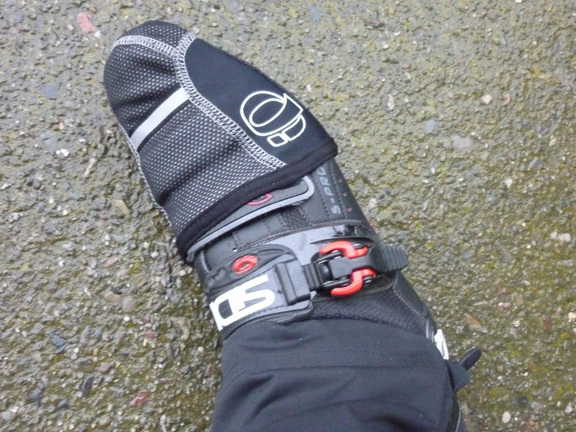 Likewise, cycling in snow can demand gear where some of the things outlined below are irrelevant. Nevertheless, what follows is my experience keeping my feet dry or, at least, comfortable while using clip-less pedals and shoes. With clip-less pedals, you are obviously focused on pedaling performance which means you are already using a shoe that is stiff and pretty well ventilated. This means, that water is going to go right into and out of the shoe constantly unless you cover it with something. Although, there are rain guards for cycling shoes, I have found the exposed and wet scenario is actually fine provided you have the right socks. I tried the full booties that slip over the shoes. They work great but they are not breathable so you can wind up with sopping wet feet from your own perspiration. Also, if rain does get in there, it doesn't easily come out. Finally, the booties are a bit of a pain to get on. As a remedy, I tried the "half-booty". These are slightly easier to get on but were pointless in the rain and not much help in the wind. They had the inconvenience of full booty installation without any of the moisture protection. The rain simply went up and over the half-booty and into my shoe. Consequently, I now go out with nothing special on my shoes but something special on my feet. I wear soft nylon socks. They get wet but they dry so quickly that they feel pretty normal when I reach my destination. I even leave them on at work. The obvious exception not yet covered is snow. If you are riding in snow then all bets are off regarding perspiration. In that case, the full booties are the way to go. I'm fond of the socks like these by DeFeet. They are cheap, they look great in business or cycling shoes, and they dry super-quick. For the hands, I use two options. If I'm commuting, then sooner or later I'm going to need a lot of finger dexterity to get my metro card out or money or something. 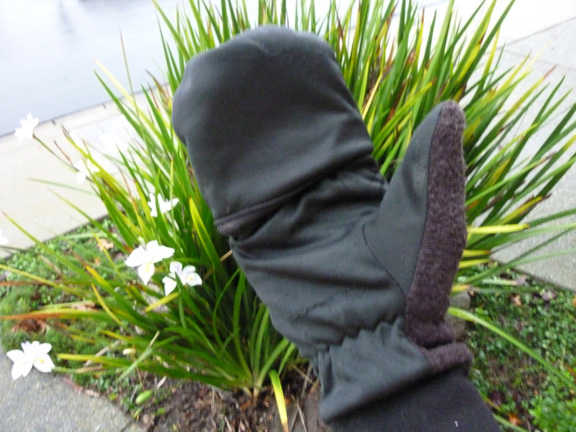 I haven't found a full glove yet that does that well but I did recently find these cool mittens with a quick-release finger flap. The finger compartment slides off when you need your fingers. Very cool when fumbling for your metro pass in a commuter line. The only issue has been that these slip a bit on my brake handles. I bought them at a runners shop so they are not designed for cycling. Otherwise, these are totally cool. Some cycling glove vendor needs to take note. 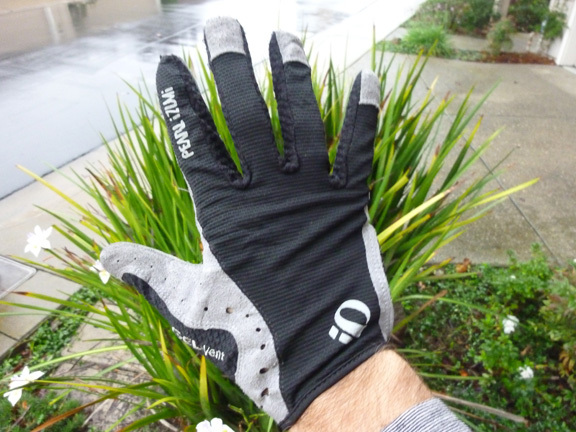 For a regular cold ride, I use these Pearl Izumi full-fingered gloves. Very nice dexterity. I can even run a smart phone touch screen with them. The only bummer has been the netting in the palm tears easily during a crash and the gel pads fall out. However, most gloves don't last long when sliding on asphalt. Regardless, I forgive this because they feel so good the rest of the time. This gear isn't the cheapest but I think it is the best. Again, I've wasted a lot of time and money trying to skimp. In the end, I wound up with this stuff and now I don't think twice about going out on any type of day. The gear keeps me perfectly dry and/or comfortable year-round. If cycling is going to become a serious form of transport, gear like this is what it is going to take. Awesome tips! 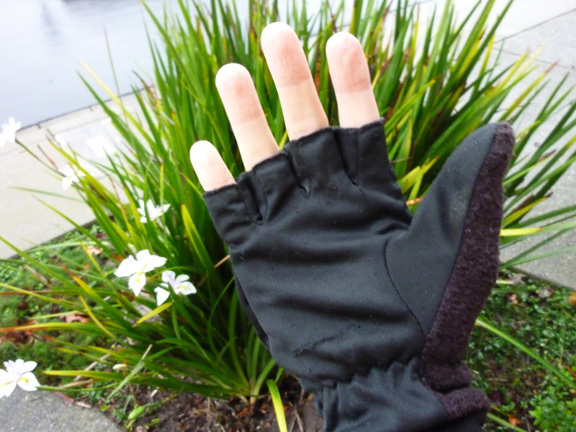 Bigger challenge: finding gear that works in the rain... for women! Extra stuff that really helps in a pinch: a shower cap that fits over the helmet, and thin latex gloves that fit under the fingerless riding gloves. Both provide great protection in wind, cold and rain. Both fit in my small seat bag for contingencies.